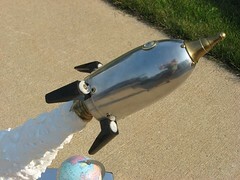 Bottle Rocket is made from an antique baby bottle warmer, brass candle stick parts, mixer stand. 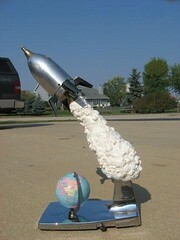 If you look close you can see a little astronaut looking out the window. Made this one for a friend who collects Day of the Dead stuff. 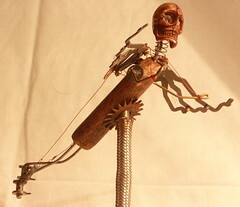 It's my second wood and skull robot, this time with a steampunk twist. 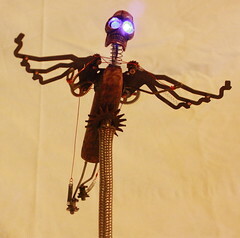 The wings are made from typewriter mechanisms; body is the handle from an old chisel; skull is from a mardi gras necklace. I stamped "YOU SHALL LIVE", from Ezekiel 37, on the base. Facebook: "To invent, you need a good imagination and a pile of junk. 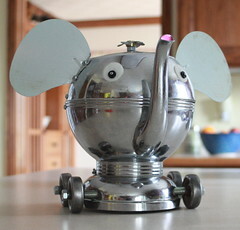 -Thomas A Edison"
Coffeebot is made from a 40 cup coffee pot, a bun warmer, extension ladder feet, and camera lenses. 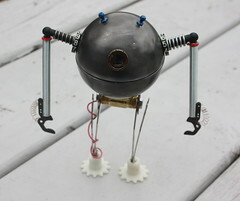 Grinderbot was made a couple of years ago. 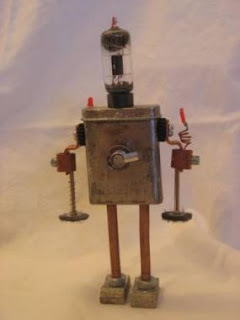 He's made from a Starbuck's mint tin, vacuum tube, Dremel brushes, copper tubing, and electric motor parts.